High Tech Health is one of only 3 American infrared sauna companies that design their own heaters, and we’re probably the only one that designs them with in-house expertise rather than by less knowledgeable contractors. In fact, our President has a degree in Electrical Engineering and feels that our company has an obligation to utilize our significant expertise to dispeling the many misconceptions about heaters and about EMF. What Level Should You Be Looking For? EMF consultants in the United States typically recommend keeping exposure below 10mG (1 uT) per the National Council of Radiation Protection and Measurements (NCRP) draft report published in the July/August 1995 issue of Microwave News. Evidence supporting biological effect is still coming in and has not yet resulted in requirements, or even scientific consensus. The precautionary principal says that without certainty, it is recommended that people minimize their risk by prudent avoidance. That means that consumers are safest if they choose products with the lowest levels. It is now our company's opinion that EMF will ultimately be confirmed to have a biological impact worth avoiding. It is worth noting that levels below 2mG (0.2uT) are below levels currently understood to pose a potential biological effect. Levels below 1 mG (0.1uT) are very very low and generally lost in the background. Maximum magnetic field is the most important measurement relating to magnetic field because it tells you whether you are going to be exposed to levels above the threshold for potential biological affect. 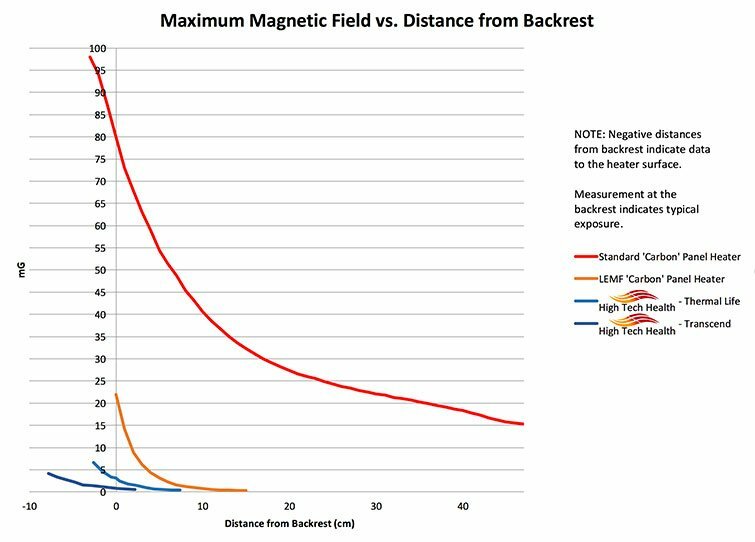 Every company besides High Tech Health is only emphasizing an average magnetic field from a handful of points (such as 5), and suggesting that this is a complete picture of your exposure. Only one other company is actually providing a maximum measurement from their sample heater, and they leave it hidden inside a third-party report. Every other company is withholding this information, and it is not present even in their reports supporting their claim for “low” or “ultra low” EMF. The reason they are hiding this information, is because their heaters have spots where the magnetic fields are greater than 10 mG. The one other company that you can find a maximum value from their sample heater shows that the heater is running at 240V (therefore has ½ the magnetic field of an equivalent power 120V heater) and that value is still 13.8mG. In fact, carbon heater panels with magnetic field mitigation (so called “Low EMF” or “Ultra Low EMF”) often have spikes above 20 mG.
First, it is important to note that magnetic field mitigation is accomplished by cancellation. Lowering magnetic field is therefore dependent upon skillful design as well as manufacturing precision and tight tolerances. Second, it is important to note that NO sauna company guarantees magnetic field levels because that would require EVERY product to be competently tested during production – very few companies have that expertise, and no consumer could afford that if they did. We have tested supposedly low EMF carbon heaters from every major factory, and every one of them suffers from magnetic field spikes 10x to 20x higher than the heater's average levels. These spikes are the result of insufficient manufacturing tolerances, as well as design weaknesses. High Tech Health heaters are manufactured to more precise tolerances and with better design than any of the other so-called “Ultra Low EMF” heaters. That means that our heaters cannot have the significant variation in magnetic field maximums that are seen in carbon heaters. In fact, our heaters have no spikes, and will exhibit very little variation in magnetic field, especially as measured at the backrest. See the summary section below for what you can expect from your High Tech Health sauna and why it surpasses the competition.